Fairbanks Morse is one of the great old school manufacturing companies in the U.S. In 1830, Thaddeus Fairbanks invented the first platform balance scale and opened a business with his brother, Erastus. Charles Morse joined the company in 1850, and by 1865, the first branch to be known as Fairbanks, Morse and Company was established in Beloit, Wisconsin. View of main engines. Yellow canister air filters, right and left. Summer of 2017. Port main engine. Summer of 2017. Starboard main engine. Summer of 2017. Since 1938, Fairbanks Morse Engine has supplied the U.S. Navy with diesel power for their submarine fleet. 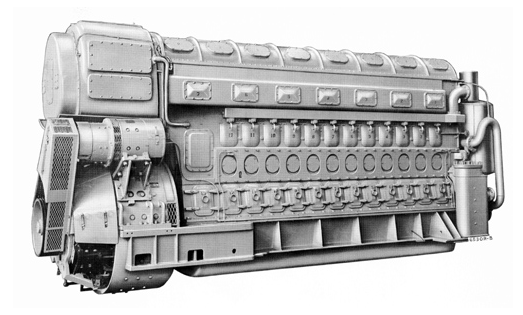 When the Navy went to nuclear power, the 38D-8-1/8th diesel remained as the back-up engine for the Seawolf-class through the 1990s. Fairbanks Morse is a trusted source for application-specific, fuel-flexible power systems that deliver optimal performance in mission critical applications. In addition to marine use, dual-fuel versions of the 38D-8-1/8th motor can be found powering a wide range of municipal, institutional and industrial applications. This dual-fuel technology is high-efficiency and produces power that is both low-cost as well as low-emission. The 38D 8 and 1/8 Fairbanks Morse engines are a bit unusual. Instead of one piston per cylinder like most modern engines, the 38D 8 1/8 has two pistons per cylinder. There are two crankshafts: an upper and a lower crankshaft connected by gears on one side of the engine. During the compression cycle the two pistons head towards one another and combustion takes place in the center of the cylinder. As a result, the 38D-8- 1/8th is a two cycle engine as opposed to the more common 4 cycle motors of today. Above: This diagram shows the unusual arrangement of the pistons and connecting rods in the Fairbanks Morse Opposed Piston diesel engine. Two pistons share the cylinder, one connected to the upper crankshaft and the other to the lower crankshaft. Timing between the two crankshafts is coordinated by a vertical drive with a spring cushion pack. Above: The 12 cylinder Fairbanks Morse 38D-8-1/8 engine was an extremely powerful prime mover at the time of its introduction, typically rated at 2400 horsepower in the Roots blower version. The same engine with series turbocharging was rated at up to 3600 horsepower. 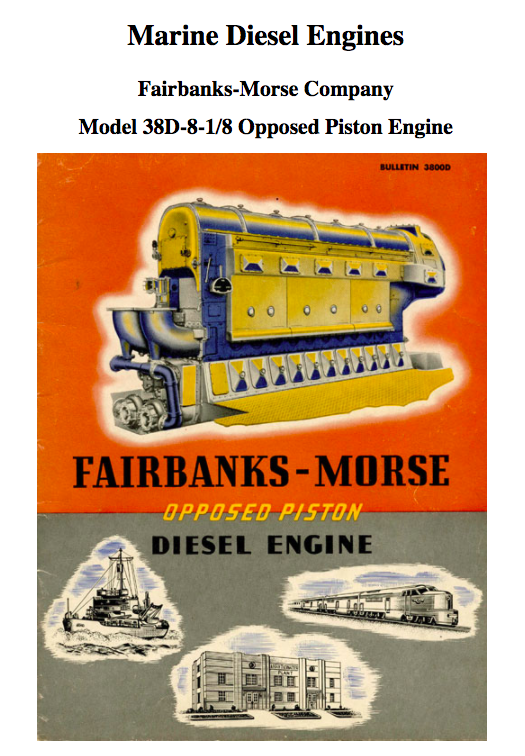 Fairbanks Morse advertising in the marine trade press took full advantage of the excellent record of their engines in World War Two U. S. Navy Fleet Submarines.